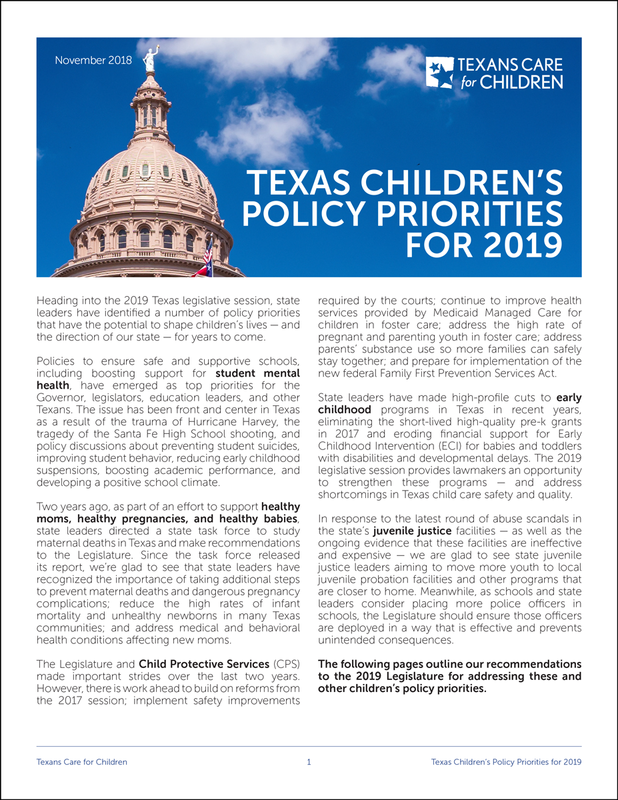 Heading into the 2019 Texas legislative session, state leaders have identified a number of policy priorities that have the potential to shape children’s lives — and the direction of our state — for years to come. Policies to ensure safe and supportive schools, including boosting support for student mental health, have emerged as top priorities for the Governor, legislators, education leaders, and other Texans. The issue has been front and center in Texas as a result of the trauma of Hurricane Harvey, the tragedy of the Santa Fe High School shooting, and policy discussions about preventing student suicides, improving student behavior, reducing early childhood suspensions, boosting academic performance, and developing a positive school climate. Two years ago, as part of an effort to support healthy moms, healthy pregnancies, and healthy babies, state leaders directed a state task force to study maternal deaths in Texas and make recommendations to the Legislature. Since the task force released its report, we’re glad to see that state leaders have recognized the importance of taking additional steps to prevent maternal deaths and dangerous pregnancy complications; reduce the high rates of infant mortality and unhealthy newborns in many Texas communities; and address medical and behavioral health conditions affecting new moms. The Legislature and Child Protective Services (CPS) made important strides over the last two years. However, there is work ahead to build on reforms from the 2017 session; implement safety improvements required by the courts; continue to improve health services provided by Medicaid Managed Care for children in foster care; address the high rate of pregnant and parenting youth in foster care; address parents’ substance use so more families can safely stay together; and prepare for implementation of the new federal Family First Prevention Services Act. State leaders have made high-profile cuts to early childhood programs in Texas in recent years, eliminating the short-lived high-quality pre-k grants in 2017 and eroding financial support for Early Childhood Intervention (ECI) for babies and toddlers with disabilities and developmental delays. The 2019 legislative session provides lawmakers an opportunity to strengthen these programs — and address shortcomings in Texas child care safety and quality. In response to the latest round of abuse scandals in the state’s juvenile justice facilities — as well as the ongoing evidence that these facilities are ineffective and expensive — we are glad to see state juvenile justice leaders aiming to move more youth to local juvenile probation facilities and other programs that are closer to home. Meanwhile, as schools and state leaders consider placing more police officers in schools, the Legislature should ensure those officers are deployed in a way that is effective and prevents unintended consequences. The following pages outline our recommendations to the 2019 Legislature for addressing these and other children’s policy priorities. Recommendations on student mental health, safe and supportive schools, support for children with serious emotional disturbance, and more. Expand the use of school-based programs, practices, and policies that: (1) create safe and healthy school climates: (2) promote the social and emotional development of students; (3) are trauma-informed; (4) prevent youth substance abuse and suicide; and (5) connect students to mental health services and supports in the school or community when needed. Increase student access to school counselors and school-based mental health professionals. 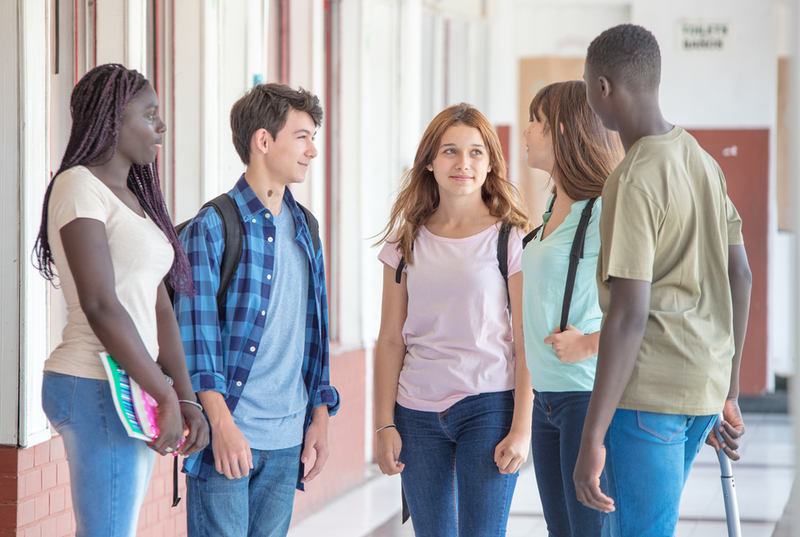 Establish a state center to serve as a reliable source of information, training, and technical assistance for schools on implementing campus-wide and youth-targeted practices that improve student mental health, behavior, and school climate. Expand access to intensive community-based services and supports, including family peer support services, to ensure children can remain in their homes and schools while being treated for serious emotional disturbance and avoid being placed in inpatient and/or residential treatment center (RTC) settings. Improve the quality of care and treatment provided by state-contracted psychiatric RTCs, including the use of trauma-informed treatments and practices and linkages to community-based services. Ensure children with serious emotional disturbance receive state mental health parity protections by defining serious emotional disturbance in the state insurance code and requiring health benefit plans to provide coverage for serious emotional disturbance. Recommendations to promote healthy pregnancies; address substance use disorders affecting families; ensure Medicaid meets the needs of new mothers and children with disabilities, in low-income families, and in foster care; and more. Protect and strengthen investments in critical programs aimed at improving maternal and infant health, including Medicaid, Children’s Health Insurance Program (CHIP), the state’s women’s health programs, and community-based mental health and substance use treatment and recovery programs. Prevent tragic maternal deaths, reduce dangerous pregnancy complications, and support healthy mothers and babies by improving access to insurance coverage during the year after giving birth and during the time between pregnancies. Support Department of State Health Services’ (DSHS) efforts to implement maternal safety initiatives statewide and adopt a care coordination pilot with community health workers as essential ways to address racial disparities in maternal and infant health. Ensure new mothers facing maternal depression or substance use challenges receive health care and supports they need to thrive by supporting family-specialized substance use treatment programs that allow parents and children to stay together during recovery; maximizing opportunities to identify issues early and refer to treatment; and supporting collaborative care models that integrate primary and behavioral health. Improve teen health and reduce unplanned pregnancies by ensuring young adult women exiting Children’s Medicaid or CHIP smoothly enter the next coverage option — such as Healthy Texas Women — rather than falling through the cracks. Enhance access to prenatal and postpartum care by improving Medicaid’s non-emergency transportation benefit so that more mothers and their children can travel to medical appointments. Make prudent, critically needed reforms to Medicaid managed care — the health insurance program for many children, pregnant women, seniors, and people with disabilities in Texas — including steps that improve state oversight and coordination, better enforce provider network standards, and strengthen care coordination services so they work more effectively for families and health providers. Recommendations to prevent abuse and neglect, support pregnant and parenting youth in foster care, address substance use among parents, and more. Leverage new federal funding opportunities in the Family First Prevention Services Act to engage parents in prevention services that address mental health and substance use disorders and that support pregnant and parenting foster youth. Give families experiencing substance use disorders the best chance at success by investing in services that enable parents and children to stay together during the course of treatment, build parenting skills, reduce child abuse/neglect, and improve child outcomes. Track substance(s) used when parental substance use is identified as a factor in removal in the CPS IMPACT information system, with the goal of evaluating regional/local trends and tailoring health interventions effectively. Invest in Family-Based Support Services (FBSS) to provide a cohesive continuum of services that address the underlying causes of substance use — including mental health, housing, social, and financial — and expand the use of FBSS for parents with mental illness and substance use disorders as well as pregnant and parenting youth in foster care. Expand evidence-based pregnancy prevention programs that are tailored to youth in foster care. Improve DFPS data collection and reporting to more accurately understand the prevalence of pregnant or parenting youth in foster care and the capacity and geographic distribution of foster placements tailored to serve their distinct needs. Increase investment in therapeutic foster home capacity for children with more complex physical and behavioral health needs and ensure more children and youth receive services in family-like settings rather than congregate care. Recommendations for pre-k, Early Childhood Intervention (ECI) for young children with disabilities and delays, safe and healthy child care, suspensions of young children, and more. Invest in full-day, formula-funded, high-quality pre-k to improve school readiness and early grade success. Strengthen Early Childhood Intervention (ECI) for kids under age three with disabilities and delays by ensuring sufficient funding for ECI and save state taxpayer dollars by requiring commercial insurance to cover ECI services that are covered in Texas Medicaid. Improve the safety and quality of Texas child care by setting effective maximum child care group size and child-caregiver ratios and ensuring the state collects data on these quality indicators in licensed child care. Ensure kids in child care maintain a healthy weight and lifestyle by updating the state's child care standards regarding nutrition, physical activity, and screen time. Modernize child care suspension and expulsion policies to ensure young children get the social-emotional and trauma-informed supports they need to be on a strong developmental path. Recommendations on safe and supportive schools, youth involved in child welfare and juvenile justice systems, juvenile justice reform, and more. Minimize unintended consequences of school police presence on campus by limiting the role of school police officers to school security, expanding youth-specific training for school police to all school districts, and improving data collection on school police actions. Improve outcomes of youth involved in both the juvenile justice and child welfare systems and enhance system efficiency through improved data sharing between the systems. Increase funding for juvenile probation departments to create capacity to keep more kids closer to their home or in their home and ensure appropriate services for youth involved in the system. Raise the age of juvenile court jurisdiction so that 17-year-olds have access to rehabilitative programming and are not automatically sent to the adult criminal justice system.